Nestled in the High Cascades of Western Oregon, you will find the Fish Lake Guard Station. The Station is a Forest Service administrative building group constructed in the early 1900s,and was in regular use between then and the 1960s. During its formal life span, it served as a guard station, fire headquarters, and remount station. The site is bordered to the southwest by Fish Lake, and encompasses 16.81 acres of gently sloping, south-facing, high plateau terrain. It hosts 18 historic buildings, structures, and sites, as well as two non-historic buildings and other structures. 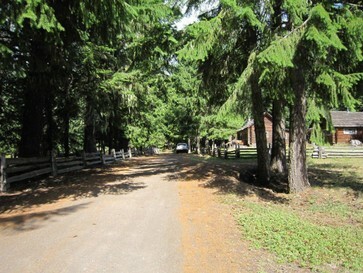 The Guard Station is listed on the National Register of Historic Places (NRHP), as is the Santiam Wagon Road, which cuts through the Guard Station compound. Once again, we call on PIT volunteers to serve as uniformed interpretation specialists for the many visitors to the Forest and the Guard Station! You will work with the public, providing information, history, and guidance during your session. During you hours "off the clock," this is a fantastic place for walks, hikes, fishing, wildlife (and people) viewing, and much more! We will only take applications until all slots are filled, though, so apply today - we hope to see you for another great season at the Fish Lake Guard Station!